By William Mackay: Unbeaten WBA interim welterweight champion Diego Chaves (22-0, 18 KO’s) says he’s been offered a fight against Amir Khan (26-3, 18 KO’s) and he’s currently considering the offer according to Ole.com. Chaves, 26, is coming off of a 2nd round knockout win over Jose Miranda last Saturday night in Buenos Aires, Argentina. Khan, 25, needs a fighter with an impressive record and some talent for HBO to approve his next fight on their network on December 15th. The last two names that were floated to HBO, Joan Guzman and Humberto Soto, weren’t good enough to get an agreement from them to televise the fight. Chaves isn’t any better known than Guzman and Soto. However, the difference is Chaves is ranked high at #1 by the World Boxing Association in the welterweight division, and he’s got respectable power. For a Khan-Chaves fight to happen, Chaves would have to come down seven pounds to 140 to make the fight happen, because it’s doubtful that Khan would want to move up in weight after his 4th round TKO loss to WBC light welterweight champion Danny Garcia last month. Chaves wouldn’t lose anything if he Khan beat him at 140, because his title is at welterweight. This would be a dangerous fight for Khan, because Chaves punches at least as hard as Danny Garcia, and he’s got an excellent uppercut that he likes to throw a lot. He’s like another Marcos Maidana type of fighter. He doesn’t seem to be as powerful as Maidana but he can punch nearly as good. Like Maidana, Chaves isn’t very fast of hand and that would give Khan a chance of beating him if he can jump up on him early. Khan would be better off trying to box this guy because he punches too hard for Khan to be taking risks right now. Chaves’ best wins have comes against Jorge Daniel Miranda, Ismael El Massoudi and Omar Weis. Chaves hasn’t faced any legitimate top tier opposition before, so this would be a really tough fight if he were to take on Khan. Chaves really doesn’t need the Khan fight to get a nice payday, as he’s ranked #1 by the WBA, which means he’ll be getting a title shot against WBA champion Paulie Malignaggi in the near future as long as he keeps winning and waits for the shot. 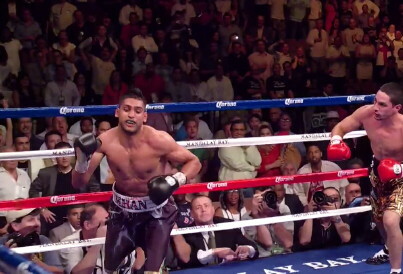 Khan could be fighting with trainer Virgil Hunter for this fight. Hunter has been mentioned as the replacement trainer for Khan, who let his long-time trainer Freddie Roach go recently after Khan was beaten in his last two fights. Khan is hoping that a new trainer can bring him back to the success that he experienced early on with Roach when Khan was able to capture the IBF and WBA light welterweight titles. If Khan takes on Chaves next, he’s going to need to be really focused on his defense the entire time because if Chaves is able to land one of his big shots, he’ll put Khan’s lights out quick. He’s not someone you would normally want to fight coming off of a knockout loss. Khan’s promoters at Golden Boy must be really confident of Khan’s talent if they choose Chaves as his next opponent. « Will Pacquiao reverse the fortunes of Freddie Roach?